Hortus Camdenensis | Rosa chinensis Jacq. A vigorous rose it is continually flowering, its crimson buds opening to silvery-pink, loosely-double or semi-double blooms with a delicate scent, usually in clusters, and darkening almost to crimson with age. In my garden it is almost evergreen, never out of flower, and grows comfortably to 2m. I have one bush growing as a low climber against a partly shaded house wall that has grown to more than 3m tall but is now regularly cut to the ground only to vigorously shoot again. Rosa chinensis Jacq. is generally regarded as a distinct species. William Paul writes in The Rose Garden: ‘The varieties of this and the preceding species (Rosa semperflorens, the Crimson China) are included in one group by many cultivators; and in some of the hybrids the balance is so nicely adjusted that it is hard to say to which species they belong.’ [Paul 1888, 1903]. A China rose, known to have been in cultivation in China since at least the 10th century, it was introduced into Europe a number of times in the 18th century. It is one of C. C. Hurst’s Four Stud China’s which are present in the parentage of almost all modern roses. 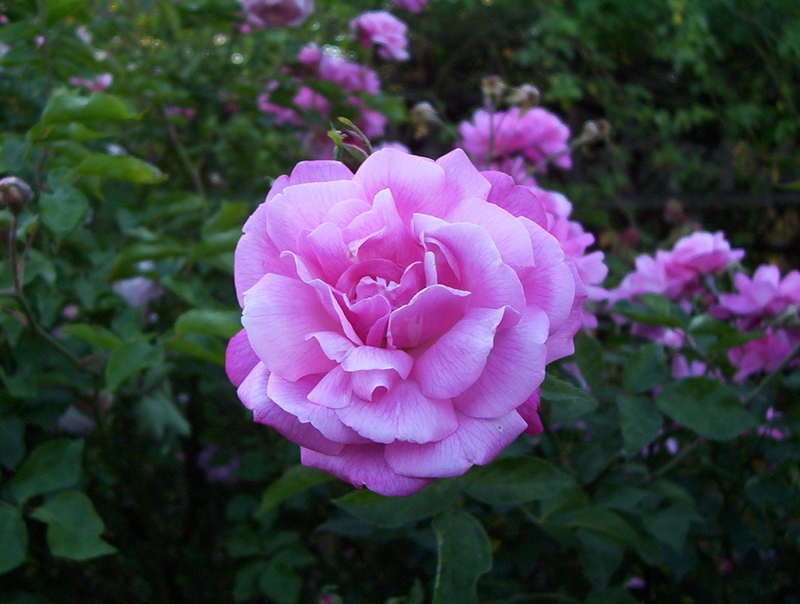 An ancient rose, very popular in European gardens and there are many references in Victorian gardening literature. As Rivers noted ‘its ever-blooming qualities have made it a favourite, from the cottage to the palace; and perhaps no plants have contributed so much to enliven our cottage walls as the common china rose and the crimson china rose.’ [Rivers 1854, 1857, 1863]. Ellen Willmot agreed: ‘The Chinese Monthly Rose has been cultivated from time immemorial and is now the most popular and widely grown rose in Europe. Of its country and origin nothing can be ascertained, but it does not appear to have been known in England before Sir Joseph Banks introduced it in 1789, and it is recorded to have flowered for the first time in Mr. Parson’s garden at Rickmansworth.’ [Willmot]. The China roses require quite different treatment to most others and as a consequence regularly featured in the advice columns of Victorian periodicals such as The Gardeners’ Chronicle: ‘[No roses] can be more [continual blooming] than the two which may be seen in front of many hundred English cottages, and known as the common and crimson china. If the cultivators will but take the pains to remove the flowers as they fade, and prevent the seed pods from swelling, they will never fail’. It was almost certainly introduced to Europe before Britain: ‘I was delighted with Haarlem. We remained there several hours to admire the beautiful garden, and to see the gardener, who is celebrated throughout Europe. The gardener showed us different kinds of plants with which we were unacquainted; amongst others, a shrub that produces beautiful flowers, of which the petals are as soft as velvet, but odourless. He told us it was called the Chinese Rose, and had been imported within the last year with great care. Roses of this species may, in fact , be seen delineated on screens and in the corners of fans’. [Memoirs of Baroness D. Oberkirch, vol. II, page 118. Haarlem, July 17, 1782]. One of the silk screens alluded to, and still in existence, was painted in the 10th century. Listed in all catalogues and described as the monthly rose in the 1843 and 1845 catalogues [T.837/1843]. China roses have been used for many years, probably almost since their introduction to Europe, to provide early warning of fungal attack of vines, William Macarthur certainly used them for this purpose. The remnants of what was presumably a hedge of this rose still exists at Camden Park, in the grounds of the Elizabeth Macarthur Agricultural Institute. Rosa Indica 4 vars. was ticked in a copy of the Hort. Reg., October 1831. Although this originally belonged to James Bowman, it is likely that this plant was grown by Macarthur earlier than 1843. [Copy held in the Special Collection of the National Herbarium Library, Canberra, ACT]. More details about Rosa chinensis Jacq.